Well, that’s one way to get some social attention: Have your dog put your trusty RV into the drink. 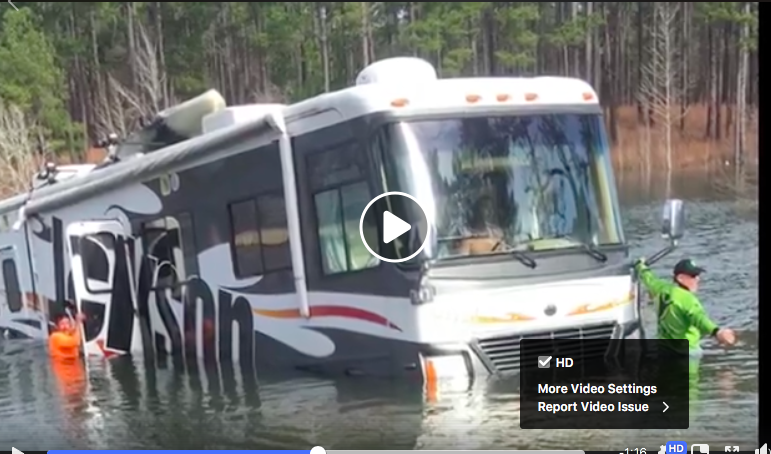 That’s what happened to Jackson Kayak owner Eric Jackson recently after his heralded Jackson RV, which has taken him and his family to rivers and bass-fishing lakes around the country, slipped into the Texas waters of Sam Rayburn Reservoir. The ensuing video clip of the dunking then went viral, appearing on everything from Inside Edition to MSN, and garnering nearly 125,000 views in its first few days on the social sphere. Here’s how it went down: EJ was backing his boat in at Sam Rayburn Lake for the first Fishing League Worldwide Tour stop on the official day one of practice, when all of a sudden his dog, a Dalmatian named Bodi, somehow managed to hit the brake and the reverse switch at the exact same time (his other Dalmatian Rocksey was on board, too). In the video you can see the reverse lights come on and then EJ kick into gear and hop in the RV to rectify matters, after fussing with the screen door. Try swapping ends in this! The Jackson RV in the lake.